Count this as reason #1,000,000 why I wish I was at Comic Con in San Diego right now. Filmmaker Quentin Tarantino waited until he was at one of the most notable festivals in the world to debut the teaser poster for his eagerly anticipated new film, THE HATEFUL 8. Probably so the entire audience can geek out appropriately. Well, allow me to geek out right now too, because I am uber psyched to see this film, and catch at least a slither of a trailer, stat. 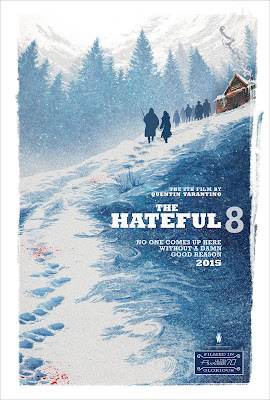 THE HATEFUL 8 opens in limited release on December 25th, and nationwide on January 8th. I'll keeo you updated as I learn more. Can't wait to see this!! !